Is the Pope a hypocrite for having a walled city? James O'Mailia says in the group "Catholic Church and the Reformation - Debates Forum:" Pope Francis is a hypocrite for having a walled city and armed security. Change my mind! Leonard Alt says: James, you are in involved in hypocrisy. The walled city that you speak of is totally open to the public. The only wall that you need to be concerned with is the wall of condescension in your own heart, which is a closed city. Remember, in the Bible where the Scribes and the Pharisees spoke down to Jesus and his Apostles for associating with sinners, tax collectors and prostitutes. Why is your Teacher eating with the tax collectors and sinners? (Mt. 9:11). James, you do have a Biblical precedent in Scripture; however, it is not the example of Jesus and his disciples, but those who speak against Jesus and His Church. Please do not follow the example of hypocrisy of the Scribes and Pharisees; do not do as they do (Mt. 23:3). 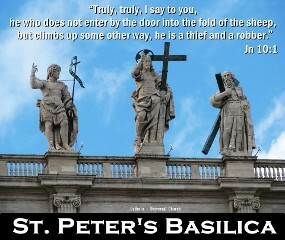 Follow Jesus and his Catholic Church. Jesus made a promise to His Church. He said that the gates of Hades will not overpower it (Mt. 16:18), and neither will James O'Mailia. James: I’ll take my chances thanks! Leonard: James, I know you don't like walls, but walls are no real problem so long as you know where the narrow gate is. Jesus said to enter through the narrow gate, wide is the path to destruction (Mt 7:13)! James: And I want a big beautiful gate on Trumps wall to let all good people in legally. Leonard: There is nothing wrong with big beautiful gates so long as we understand that the gate to salvation is a narrow one. It is interesting in that those who choose not to use the narrow gate are thieves and marauders, none of these will inherit the kingdom of God (Eph. 4:28).